If you get the message that there are no batches currently available when you try to download a new batch, be aware that it is probably because the arbitration of records is not keeping pace with the indexing. If indexing gets too far ahead of the arbitration, the programs stops new batches from going out until the arbitration starts catching up. If you get the message about no batches currently available, just wait a bit and try again. Don't give up! I'm getting reports of records that contain only information on a bride or a groom but not both. An image or two later, the other half of the record is on another image but it too is incomplete. Please index each of these images as if it is the only information available. Complete as many of the fields as you have information for. When you get to the next image that contains other information about that same marriage, index it in the same way, marking any fields not filled in as blank (Ctrl+B). This will allow for the records to be found easily in the index, but there is no way for us or GSU to merge the two or three parts of a marriage record if they are on different images. Each image must stand alone. The Indiana Genealogical Society was proud to award five Genealogy Grants at their Annual Conference on April 28 in Fort Wayne, Indiana. Checks for $500 each were presented to representatives of these organizations during the Annual Meeting portion of the IGS conference. Over the life of the Genealogy Grant Program, the Indiana Genealogical Society has awarded a total of $13,000 in grants. IGS is pleased and proud to support so many fine local projects and to support local societies in their efforts to improve genealogy in Indiana. Interested societies are invited to apply for 2008 grants. Applications must be submitted to IGS by December 31, 2007. All applicants will be notified by March 1, 2008, and the winners will be recognized at the IGS annual conference on April 4-5, 2008 in Evansville, Indiana. Application forms are available from the IGS website (http://www.indgensoc.org/grants.html). For more information on the program, contact Grant Manager Ron Darrah (darrah@comcast.net). A. Soundex. Use a Soundex Guide or computer generated Soundex. C. Misinterpretations. Bickle recorded as Pekkel or person said Selma and recorder wrote Thelma, etc. D. Phonic spellings. Phlaum recorded as Flamm, etc. A. Desire to “Americanize” names. Croneski to Crone, etc. B. Desire to simplify names. Summerschein to Summers, etc..
C. Desire to avoid ethnic bias. Schwartz (German) = Black (English), etc. D. Lack of translation potential. Umlaut spelling, etc. E. Maiden vs. married surnames. D. Legal changes. Just did not like birth name, so legally changed it. C. Named for favorite relative, friend, famous person, Bible name, etc. E. New name when grown (Example: all sons named Johannes until “of age” then use only middle name so Johannes Adam becomes Adam). 1. Go to the basic plan of working from the known to the unknown and squeeze data. 2. Go to living relatives with the challenge of providing the last known name of ancestor. 4. Look at records of people close in family, friendship, location and stretch connections. 5. Consult experts in genealogy, the family culture , locations, family languages, etc. BELTZ—I am looking for information about the parents of my great-great-great-grandmother, Malinda BELTZ (born 1818 in Ohio), pictured at left, who married Rev. William B. LEWIS on 19 March 1835 in Scott County, Indiana. The Lewis family was from nearby Jennings County, and Malinda and her husband lived there for the rest of their lives. I have a theory I haven't been able to prove yet. I suspect that Malinda's father was Andrew Beltz. According to Bureau of Land Management records, an Andrew Beltz who lived in Hamilton County, Ohio purchased land in Scott County, Indiana in 1835. I can’t find anyone with the Beltz surname in the 1830 census for Scott County, and Andrew Beltz doesn’t appear in the 1840 census, but in the 1840 census for Jennings County there is a Jane Beltz listed as a head of household—she is on the same page as William B. Lewis. In the 1850 census Jane Beltz has remarried to a DUNCAN and moved back to Hamilton County, Ohio. 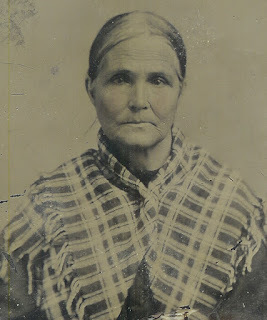 She has a son, Andrew Beltz (born about 1836) and a daughter, Mary Beltz (born about 1838). My theory is that Andrew Beltz married the much younger Jane in Hamilton County, Ohio. He purchased land and moved to Scott County, Indiana in or before 1835, when he was in his 60's. I suspect this is how my great-great-great-grandmother Malinda came to Scott County. I think Andrew fathered two children by Jane, Andrew and Mary, and died between 1838 and 1840. I hope someone can help me prove or disprove this theory. MORRIS/JOHNSON/RINEHEART—I recently purchased some antique cameras, and included with them were several reels of old family movies. One of the reels is labeled MORRIS/JOHNSON/RINEHEART (names of the families, I assume) and includes footage of a rather substantial home in Indianapolis. Other reels include film of France, Nassau, Jamaica, Romania, Canada (taken in 1929), Havana, Rome, London, Budapest, Vienna, Florence, Venice, Normandy, Lafayette Republic, Milan, Swiss Versailles, Paris and Panama. I would love to be able to find a descendant of these families, to give the films back to their rightful owners. 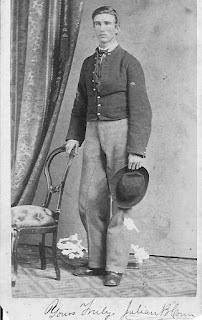 This is a photo of Julian B. CONN (born about 1844 in Ohio), wearing his Civil War uniform. The photo was taken in Cincinnati, Ohio. What happened to him? According to the Civil War Soldiers and Sailors System, he served as a private in Company H of the 34th Regiment of the Ohio Infantry and left as a corporal. Other Conn families went from Huntington County, Indiana to Washington County, Arkansas—how does Julian fit in? Julian was last seen in the 1860 census in Cincinnati, Hamilton County, Ohio in the household of his parents, John E. Conn (born about 1817 in Ohio) and Mary A. (born about 1821 in Ohio). They were still living in Cincinnati for the 1870 census. The Adams County, Indiana Genealogical Society (http://www.rootsweb.com/~inadams2/acigs.htm) will have a special dinner meeting on May 3 beginning at 5 pm at the Toscani restaurant in Fort Wayne (120 W. Wayne St., Ft. Wayne IN). After the dinner, there will be a tour (beginning at approximately 6:45 pm) of the nearby Allen County Public Library and its newly renovated Genealogy Department. Reservations are needed for the dinner--contact Karen Adams, phone (260) 589-3019. --Eudora Lenore “Dora” (born about 1862 in Minnesota)—my great-grandmother. She married Thomas McKENNETT and they lived in Webster, South Dakota. Family legend says Henry’s wife Emily may have died after giving birth to twins. As a young girl, their daughter Dora was sent to live with a relative, perhaps in Iowa. Henry supposedly moved to Brownsdale to sell fly paper. Looking for a marriage that supposedly took place in Indiana between Luther O. Scofield (born about 1819 in New York) and a woman named Susan Ann (last name unknown). The marriage occurred circa 1839-1843. It is not found in the Indiana State Library's marriage index up to 1850. Luther Scofield is in the 1850 and 1860 censuses in Branch County, Michigan, next to H.C. Scofield (born about 1823 in New York) and Gardner Scofield (born about 1792 in Vermont). BELL—Looking for information about John BELL who was born in 1800 in England and died in 1856 in New Albany, Floyd County, Indiana. He emigrated to the United States before 5 July 1827, when he married Sarah Ann CHANCE in Harrison County, Indiana. In 1828 he purchased land near New Albany, where he farmed. The 1840 and 1850 censuses list him in Franklin Township, Floyd County. Where in England was John born? When and where did he arrive in the United States? Family legend says he came through the port of New Orleans, but I have been unable to find him in those records. I would also like to find out who his parents were. In the 1850 census for Floyd County John is next door to an Ann Bell (born about 1775 in England)—is Ann his mother or a relative? She has James Bell (born about 1811 in England) and John H. Bell (born about 1828 in England) living with her—are they her sons? Any help will be greatly appreciated and reciprocated. If you have any information, please contact Camilla R. Fink (550 Torwood Ln., Los Altos CA 94022; camilla2@sbcglobal.net) directly. COX--Looking for proof that the Christopher COX who was born in 1773 and died in 1863 in Washington Township, Brown County, Indiana was the father of Cornelius “Neely” Cox who was born about 1805 in Kentucky and died in 1856 in Texas. This Christopher Cox married Hannah JOHNSON. If you have any information, please contact Patti Pegues (pegpatti@gvtc.com) directly. LAYTON—Seeking information on the family of George Preston LAYTON (born 1795 in New Jersey; died 12 April 1883 in Mattoon, Coles County, Illinois). Of his birth family, I only know that his mother was Deborah (born about 1763 in New Jersey), who was living in his household in the 1850 census. George Layton married Elizabeth LAMAR (born 29 July 1821 in North Carolina; died after 1880) on 12 April 1838 in Union County, Indiana. According to some census reports, Elizabeth’s brother, Josiah Lamar, lived next door to them. --Abigail M. (born about 1842 in Indiana; died 17 March 1897 in Hendricks County, Indiana; buried at West Branch Friends Cemetery near Coatesville). She married: 1) Robert P. FIGG on 2 January 1859 in Putnam County, Indiana; 2) Zimri WARREN on 21 September 1866 in Hendricks County, Indiana. --Andrew T. (born 19 July 1844 in Indiana)—married Josephine WILKERSON on 23 December 1869 in Hendricks County, Indiana. He lived in Greencastle, Putnam County, Indiana and suffered the rest of his life from injuries received during the Civil War. --Martha Melinda “Linnie” (born 6 August 1853 in Indiana)—married Charles HARDY (born about 1843 in New Hampshire) on 16 February 1871 in Hendricks County, Indiana. He was a railroad engineer and they moved to Mattoon, Coles County, Illinois by the 1880 census. They were my great-grandparents. --Laura B. (born about 1856 in Indiana)—married Joseph NOBLE on 20 February 1873 in Hendricks County, Indiana. George Layton raised his children in Hendricks and Putnam counties. He and his family were in the 1850 census in Harrison Township, Union County, Indiana. They were in Clay Township, Hendricks County, Indiana by the 1870 census. By the 1880 census, George and Elizabeth were in Mattoon, Coles County, Illinois, next door to their son-in-law Charles Hardy. George Layton was the manager of a tannery when he married Elizabeth, but later became a teacher during the winters and a farmer during the summers. He was involved with DePauw University in Greencastle when it was still known as Asbury College, and was friends with a noted historian, Professor RIDPATH or REDPATH. If you have any information, please contact Karolyn Raush (KLUDDITE@aol.com) directly. Marriage Indexing: 150,000 and Counting! When the answer to "Is this the first marriage" is yes, leave the number of marriage field BLANK by simply skipping over it with the TAB key. When the answer is no, then type EXACTLY what is written on the document. If it says "once," then you type "once." If it says "two,' then you type "two." And if it says absolutely nothing, then you type absolutely nothing, and skip the field with the TAB key. DO NOT enter street addresses! Thomas Vance was a cabinetmaker and the family was in Indianapolis beginning with the 1860 census. They lived at 623 East Vermont Street (I have a photo—dated 20 August 1899--of Susanna and 4 of the children standing in front of the house). George Washington Vance and wife Margaret had a daughter, Rebecca Florence Vance (born 17 December 1887 in Philadelphia, Pennsylvania). Rebecca was my grandmother and she married Joseph Trucksess HENRY. After George Washington Vance died, his wife remarried about 1897 to Fenwick FIELDING (born March 1865 in Canada). If you have any information, please contact Charlie Henry (25817 Ridgewood Dr., Farmington Hills MI 48336; cmhenry@arounddetroit.biz) directly. The DeKalb County, Indiana Genealogy Society (http://www.rootsweb.com/~indkigs/main_page.html) will meet May 14 at 6 pm at the old Carnegie Library (corner of Pearl and Main Streets, Butler IN). Sally Garrett will give a tour of the DeKalb County Historical Museum. The Shelby County Genealogical Society (P.O. Box 434, Shelbyville IN 46176) will have a tour of Forest Hill Cemetery (located on Morris Ave. in Shelbyville) on June 16 at 11 am. The tour will be led by superintendent John Scudder. The cemetery tour will be preceded by a meeting of the society at 10 am in the Blue River Foundation Building (54 W. Broadway, Shelbyville IN). The public is invited to attend both events. The Washington County Historical Society (http://www.blueriver.net/~jhc/) will meet June 23 at 6 pm at the Stevens Memorial Museum in Salem, Indiana. The society has a genealogy library that is open daily from 9 am to 5 pm. The Bartholomew County Genealogical Society will meet May 26 at 1 pm at the City Cemetery in Columbus, Indiana (located in the 800 block of 16th St.). There will be a program about how to read old tombstones. The Allen County Genealogical Society of Indiana (http://www.acgsi.org/) will hold their annual Dinner Meeting on Wednesday, June 13 at 6 pm at the Allen County Public Library in Fort Wayne (http://www.acpl.lib.in.us). Volunteers will be recognized and certificates of recognition will be presented to “First Families” and “Homesteaders” applicants. The dinner will be catered by Classic Café. To make your reservation, please call (260) 637-7601. The Allen County Genealogical Society of Indiana (http://www.acgsi.org) will meet Wednesday, May 9 at 7 pm in Meeting Room C of the Allen County Public Library in Fort Wayne(http://www.acpl.lib.in.us). Librarian Delia Bourne will present a program on “Using NewsBank for Local History Research”. NewsBank is an online database of newspapers, mainly from the mid-1980’s to present. The ACGSI is celebrating its 30th anniversary this year. The Genealogical Society of Marion County (http://www.rootsweb.com/~ingsmc/) will meet Saturday, May 12 at 11 am at the Family History Center at 110 N. White River Parkway in Indianapolis (across the river from the Indianapolis Zoo). Debbie Engelking will speak on "LDS Resources." Question: Is there a space in names such as McMinn OR Mc Minn; Van Horn OR VanHorn? Questions: Reminder there are 4 records per image. I think at least one indexer does not realize they can add another record to an image. Answer: Go to TOOLS, RECORDS PER IMAGE, and set the number of records for an image before you start indexing a batch. Don’t forget to click APPLY TO ALL IMAGES before you click OK. Question: Reminder to do the 4 records on the image 1st is upper left hand corner; 2nd is lower left hand corner; 3rd is upper right hand; and 4th is lower right hand. Some indexers are mixing these up. Answer: Each image is a picture of two pages of a book. Index it in the same order in which you would read it. Start at the top left, go down to the bottom left before going to top right and then down to bottom right. Answer: ALWAYS use the most complete given name you can find on the document. Question: Type it as it is: Wm or Thos is written that way, NOT William or Thomas. SANDERS/POWELL—Seeking information on the ancestors of William SANDERS (born February 1875 in Indiana; died after 1930). His parents were supposedly born in Kentucky. He married Ann Eliza POWELL (born April 1871 in Indiana; died after 1930; daughter of Lemuel V. Powell and Rosaline L. TUCKER) on 26 November 1893 in Knox County, Indiana. When did William Sanders die? Where is he buried? He is listed in the 1930 census as John W. Sanders, so William may be his middle name. If you have any information, please contact Gerd M. Saunders (4133-224th Ln. SE #206, Issaquah WA 98029; gerds@msn.com) directly. SANDERS—Seeking information on Delmar Arthur SANDERS (born 3 August 1896 in Sandborn, Knox County, Indiana; died 10 March 1943 in Los Angeles, California; buried at Los Angeles National Cemetery). Delmar was the son of William Sanders (born February 1874 in Indiana) and Ann Eliza POWELL (born April 1871 in Indiana), who married 26 November 1893 in Knox County, Indiana. Delmar was a Private in the U.S. Army. His World War I draft registration card lists him as a resident of 122 Mill Street in Kent, Portage County, Ohio, working at a tire & rubber company. He married Evelyn A. PUTNAM (born July 1890 in Massachusetts) in 1920 and they had a son, Warren, born 3 August 1921 in Lynn, Massachusetts. They divorced in 1926 and Delmar had no contact with the family until 1940. Son Warren later changed the spelling of his last name to SAUNDERS. POWELL/TUCKER—Seeking information on Lemuel V. POWELL (born November 1842 in Virginia; died 1900-1910) and Roseline L. TUCKER (born May 1847 in Virginia; died after 1930), who married about 1868. They were in the 1870 census in Stockton Township, Greene County, Indiana, near Lemuel’s father, Daniel F. Powell (born about 1816 in Virginia). In the 1880 census they were in Grant Township, Greene County, Indiana, and in the 1900 census they were in Vigo Township, Knox County, Indiana. In the 1910-1930 censuses a widowed Roseline is in Shelburn, Sullivan County, Indiana. POWELL—Seeking information on Daniel F. POWELL (born about 1816 in Virginia; died after 1880) and wife Ann M. (born about 1818 in Virginia; died after 1880), who emigrated to Greene and Knox counties in Indiana. They were in the 1850 census in Hardy County Virginia; the 1860 census in Huntington Township, Ross County, Ohio; the 1870 census in Stockton Township, Greene County, Indiana, and the 1880 census in Widner Township, Knox County, Indiana (in the household of son Able). The Indiana Genealogical Society is looking for people to staff Indiana Genealogist, its quarterly publication (sent 4 times a year to IGS members, with a separate index issue sent the next year). The Editor is responsible for putting together each issue, using the various items (articles, indexes, record abstracts, etc.) that have been submitted. Editor's Assistants would be responsible for proofreading each issue (looking at grammar, formatting, etc.) and indexing the names from each issue. HOAG/HOGE/SODEN--I'm desperately searching for the identity of my great-grandmother. Her married name was Mary SODEN. She was supposedly born in December 1868, and she died February 14, 1899 in Chicago, Illinois, but was buried in Terre Haute, Vigo County, Indiana. Family lore says her maiden name was HOAG or HOGE. Her husband was James SODEN (born January 1872 in Indiana), son of James Soden (born June 1830 in Ireland) and Mary (born June 1847 in Ireland), who were in Vigo County. --Mary (born August 10, 1896, supposedly in Indiana)—my grandmother. --a son who was given away and was adopted at the age of 6 months. His (adopted) name was Clarence BAKER. A widowed James Soden age 28 is a blacksmith in the 1900 census in Terre Haute, living in his parents’ household at 624 Center Street and son “Jamie” is with him. There is no sign of daughter Mary. This young son James is in the household of his widowed grandfather James Soden on the 1910 census in Terre Haute—no sign of his father. If you can be of any help, please contact Tina Beck (thebecks123@hotmail.com) directly. The Indiana Genealogical Society is looking for someone to take over as editor for the IGS Newsletter, which is sent to IGS members 6 times a year. The editor is responsible for compiling and proofreading each issue. There are some regular columns that are contributed for each issue—the president’s column, “Once A Hoosier” entries, and queries—and board members, Indiana County Genealogists, IGS chapters, committee chairs, etc. may also submit items. Potential items may also come from other publications which IGS receives. According to the 1900 census entry, both of John’s parents were born in Germany. His occupation is listed as coal miner. Where in Indiana did John come from? Is this the same John Aumiller as the one who was in the 1870 and 1880 censuses in Evansville, Vanderburgh County, Indiana, born about 1852 in Bavaria, son of John Aumiller (born about 1820 in Bavaria; died after 1880; occupation miller) and ?? (died before 1870)? This John married Apolonia ?? (born February 1846 in Indiana) and had children: Fred (born April 1873 in Indiana; died after 1900) and Carrie Marie (born August 1881 in Indiana; married W.J. DECKER on October 14, 1903 in Vanderburgh County). Apolonia is listed as a widow in the 1900 census for Evansville. If you have any information, please contact Laura Rogers (laurogers@earthlink.net) directly. KILBORN/KILBURN—Searching for the parents of my great-grandmother, Emma Louise KILBORN or KILBURN. She was born 23 September 1834 in Derby, Orleans County, Vermont and died in May 1904 in Yates Center, Woodson County, Kansas. She was a schoolteacher in Lafayette, Tippecanoe County, Indiana in 1856 and married James Madison SHIPP there on 13 September 1856. They raised their children in Boswell, Benton County, Indiana and are both buried there. Emma may be the same as Emma L. Kilborn (born about 1833 in Vermont) who is in the 1850 census in Chili, Monroe County, New York, in the household of Catharine Kilborn (born about 1796) and other children Hiram N. (born about 1831), Laura E. (born about 1826) and Lawson A. (born about 1836). There is an S. Lawson Kilborn (born 28 December 1835 in Kingston, Ontario, Canada) who was a teacher in Piatt County, Illinois in the late 1800’s. A biography on him from Clark County, Illinois states his parents were William Kilborn and Catherine POWELL. If you have any information on this family, please contact Ramona S. Shuldberg (3282 S. 100 E., Bountiful UT 84010; ramonashuldberg@msn.com) directly. Marriage Indexing: W is not White & C is not Colored! The Elkhart County Genealogical Society (http://www.rootsweb.com/~inelkhar/ecgs.htm) will meet April 19 and May 16 at 7 pm at the Elkhart Public Library (http://www.elkhart.lib.in.us). The public is invited to attend. The Shelby County Genealogical Society (http://www.rootsweb.com/~inshelby/frontpage_forms/gensoc/sc_gene_soc.htm) will hold an Open House on Saturday, April 21 from 1 to 4 pm on the 2nd floor of the Blue River Foundation Building (54 W. Broadway, Shelbyville IN). Their library will be open for research, and the Shelby County Public Library (http://www.sscpl.lib.in.us/library2005/genealogy.htm) will also be open from 9 am to 5 pm that day. Congratulations to Clara Whan of Avilla, Indiana! She is our first indexer to index more than 5,000 records! What a contribution you are making, Clara. However, I have a feeling there will be about 5 or 6 others joining Clara by the end of April. Arbitrators, far fewer in number than indexers, are not that far behind, and I suspect we might have 3 or 4 of them going over the 5,000 mark in April! Good work! Stats for March are fantastic! This is our first full month of having a large group of indexers ready to go and plenty of records available for them. As you probably already know (did you hear me hollering? ), we hit the 100,000 records indexed mark on March 26 and then went on to complete another 10,781 in the last five days of the month. For a complete rundown on all our stats, please visit http://www.indgensoc.org/ and then give yourself a good pat on the back! One of our arbitrators sent me the following which definitely applies to our marriages. Please read it and use it in your indexing. Sometimes a name is recorded more than once on the same historical document. For instance, on a marriage certificate the name of the groom may appear in two or three different places. In one place, the name may be written as C. H. Johnson. In another place, it may be Chas. H. Johnson. And in still a third place, the name may be written as Charles Henry Johnson. Please take time to scan the entire certificate and type only the most complete version of the name. This will increase the chances of a researcher finding the name of an ancestor in the index." Are the older children Thomas’s from an earlier marriage? Also, the 1850 census entry also lists a Lucy Johnson (born about 1840 in Indiana) and an Emeline Johnson (born about 1843 in Indiana) in the household—are these Hannah’s children by a previous marriage? There is a William Johnson who married Hannah SCHULER on January 3, 1839 in Wabash County—is this the same Hannah who married Thomas Black in 1849? If you have any information on this family, please contact Jim Andrews (jmjandrews@ameritech.net) directly.